Buy 1 Get 1 Free Whitman's or Russell Stover. Get $3 ExtraBucks rewards for the purchase of 2 Hershey's holiday kisses or miniatures. 25% off Holiday décor, accessories or light sets. Get $10 Holiday cash card wy spend $30 on the select items. CVS Ad shows 3-day sale participating items like Gold Emblem abound bagged pistachios or almonds. Find more BOGO Deals and special discounts. In the holiday category, you have $4 ExtraBucks rewards for any 2 of the products on pg 2. Cosmetics and beauty products are available in that part of the ad. Essie nail polish or care, Holiday gift wrapping products, and Gingerbread house, train, mini village, cookie kits or Signature brand holiday popcorn tin are among the featured products. Ghirardelli holiday, original squares or bars will be BOGO 50% off! 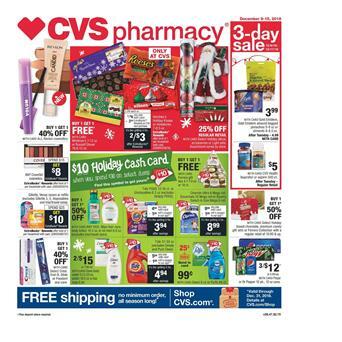 CVS Weekly Ad Holiday sale Dec 9 - 15 has snacks and candies. Stock up these beautiful products that are favourites of thousands of customers. Get ready for the parties and gatherings. You can save with BOGO 50% off deals on candies. Candy canes, Holiday M&M's chocolate bags, planters deluxe mixed nuts, and more BOGO Deals. Holiday stocking stuffers like many gifts from different categories are available on pg 5. See headsets, remote control helicopters, Wayland square ultra-soft luxury bathrobe and much more. Santa figures, Disney characters including Mickey Mouse.